We will be pleased to discuss these and any other questions you might have. 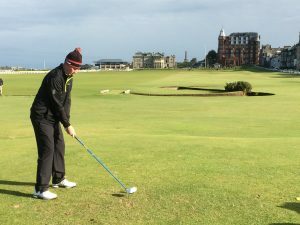 We have been creating great golf vacations for thousands of visitors to Scotland from overseas and we know the places you will really enjoy, and the golf courses you will want to play. Please complete the Enquiry Form and give us an idea of what type of tour you wish. 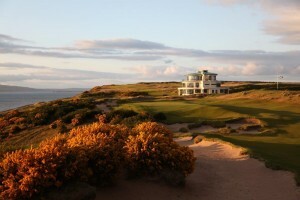 ~ How many games do you want on a links golf course and how many on a parkland golf course? ~ How many golf games do you want to play in total? ~ Do you wish a self drive golf vacation package or would you prefer to have your own driver and vehicle? ~ Do you wish some dinners included? We frequently get better rates for combined dinner bed and breakfast packages and usually recommend taking dinner on your arrival night at each new location. ~ Do you wish any other activities arranged such as city tours, distillery visits, and other sports such as off road driving, clay pigeon shooting or fishing on maybe a rest day from the golf? A rest day is recommended if your golf package is longer than 8 days. ~ Do you wish any special garments made up for you with your own group name or individuals name embroidered on golf hats, polo shirts or sweaters? ~ Do you wish any tuition included during the tour? 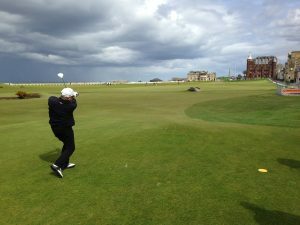 Groups have asked us to arrange a group golf practice session with a local golf pro to sort out any weaknesses in the golf swing during a tour. We can also plan an itinerary for non-golf playing spouses while you are on the golf course. We can suggest places of interest for them ensuring they are also well looked after. We try to find out what their interests are and develop their itinerary to include their preferred activities and interests.